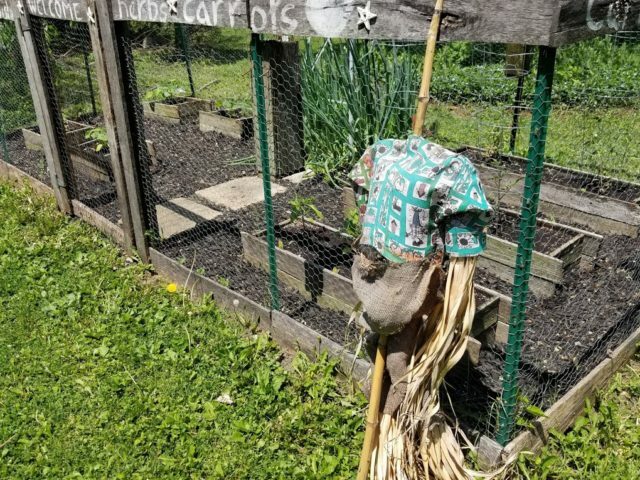 My husband recently finished planting our veggies and now it’s time to get my hands dirty and make a cute garden scarecrow. Do you have a vegetable garden? With my black thumb, I am pretty limited on my gardening skills so I will just stick with easy DIY projects. 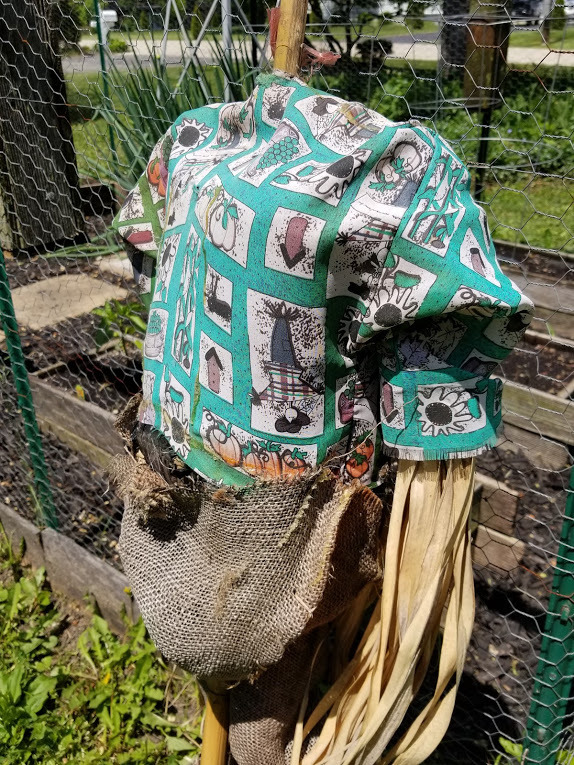 Today the Farmhouse Hens are featuring some very creative garden projects and I am so very excited to show you how I made a scarecrow happens to be hip and cool in her flannel shirt and flower pants. 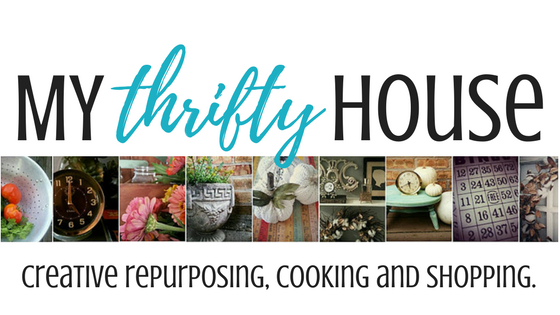 Also, make sure you scroll to the bottom of this post so you can click around and visit the talented Farmhouse Hens and be inspired by their fabulous garden projects. 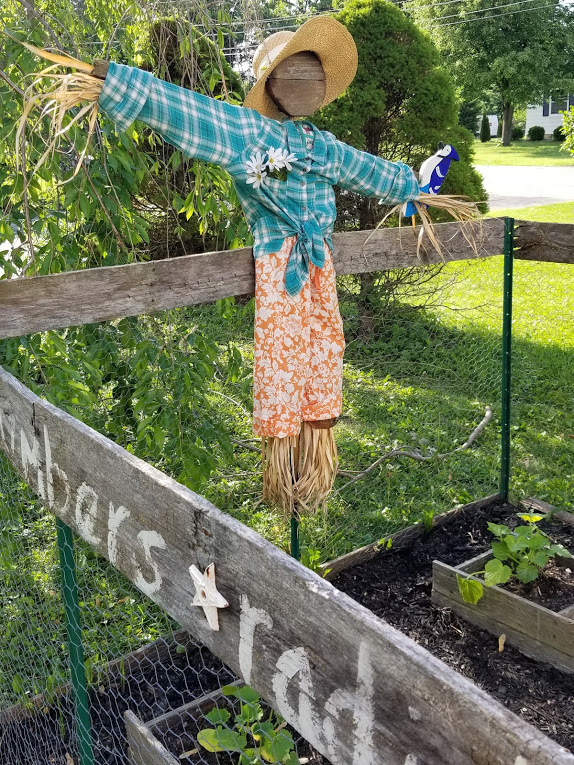 Usually, we just purchase one of those lame, cheap scarecrows from Michaels but with the wind and weather in the Midwest it is doesn’t last more than a summer. As you can see from the before pictures, the styrofoam head falls off and the clothes end up being faded and tattered. Typically, I will salvage the scarecrow one more season and turn it into a scary Halloween prop in the fall. Then it goes straight into the trash. 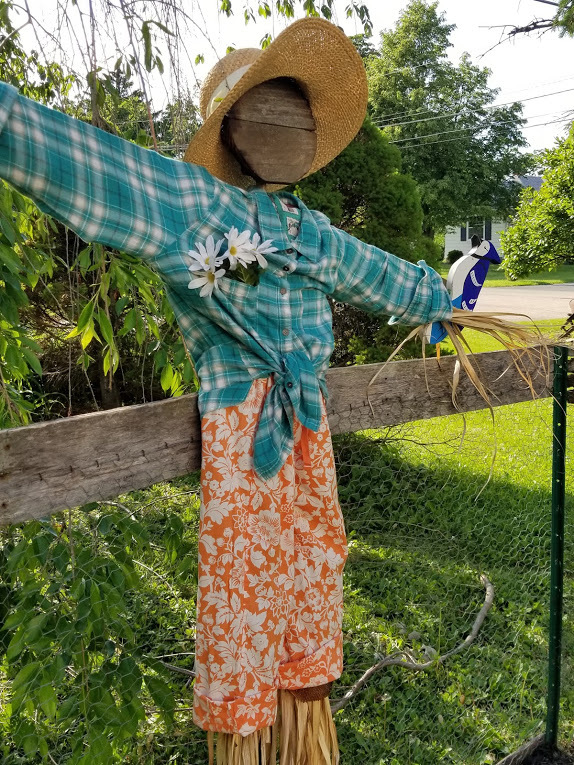 This year, I decided to recycle, reuse and repurpose what I already had on hand and make my own cute garden scarecrow because, let’s be honest, those store bought scarecrows aren’t all that cute anyway. I had my hubby bulk up the arms and attach a long piece of scrap wood from our old picket fence that fell down. He also made a round head for me using the same scrap lumber and attached it to the post with screws. I was too lazy to take off the old, faded material and I honestly thought it might completely fall apart and create extra work so I put new clothes onto the scarecrow body right over the old clothes. Also, the straw hands and feet were securely attached to the clothing and I wanted to keep that part intact. When deciding how to dress my cute scarecrow, I thought about picking up a dress or overalls from the thrift store but ended up pulling random clothes straight from the donation pile my girls had made after cleaning out their closets. The floppy hat came from an old dress up box in the basement. 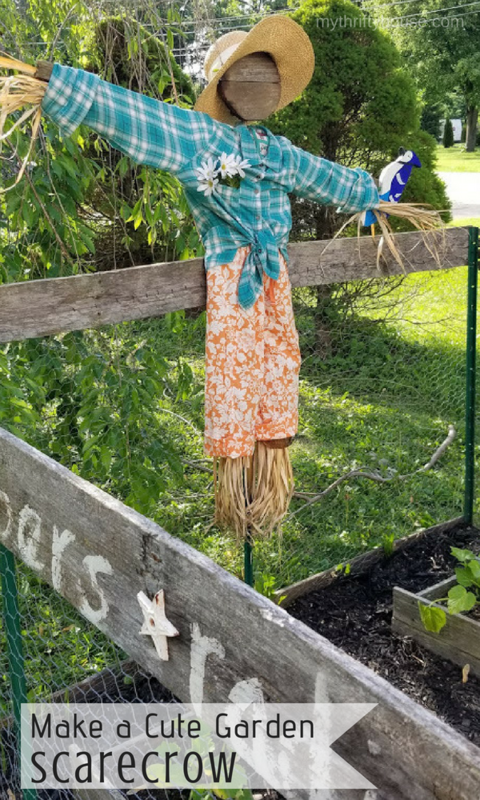 I didn’t give my scarecrow a face because she is supposed to be shooing the birds away, not welcoming them with a smile. (Except that cute wooden Blue Jay on her arm.) 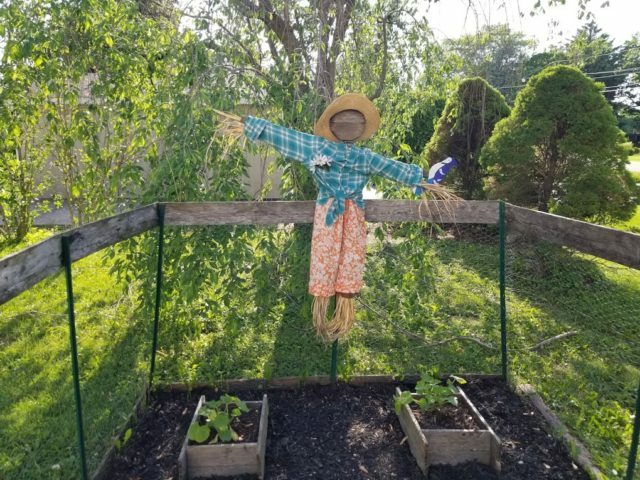 Regardless, I still think she turned out to be quite a cute garden scarecrow and serves her purpose well. Don’t forget to keep scrolling and visit the other Farmhouse Hens and all of their garden projects. This entry was posted in DIY Projects, Farmhouse Hens. 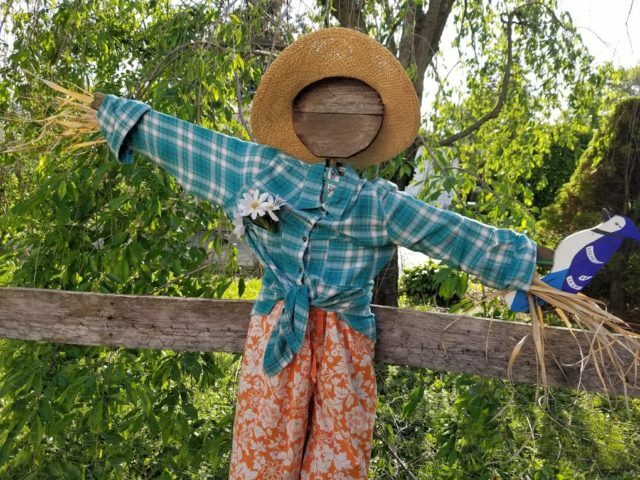 This little girl scarecrow is really cute. I love the wood face. Your yard is pretty, all lush and green what a gorgeous garden. Thanks Leanna. Yes, it is finally turning green here as we have had a ton of rain and warm temps. Oh my goodness Denise! This is the cutest thing ever! I can’t wait to hear what you name her! So creative! What a cutie pie!! I love how she turned out and you’ve used recycled goodies! I bet she’ll get the birdies away from your yummy crops! Thanks Sam. She is doing her job for sure. I haven’t seen a bird out there since we added her to the garden. That is too cute! I kinda want her outfit. 😉 Pinning. This is awesome Denise. I love her outfit and she looks so cute in your garden. I like the faceless face, very Amish. And her bird friend is an adorable touch!